University of Utah Health Care (UUHC) ranks among the nation’s top academic medical centers, having won the University HealthSystem Consortium’s (UHC) Bernard A. Birnbaum, MD, Quality Leadership Award for the sixth straight year—a winning streak matched by only one other U.S. health system. The award signifies a top-10 finish in UHC’s prestigious quality and safety rankings, a comparison of teaching hospitals based on quality measures, patient safety and satisfaction indictors, mortality rates and readmissions. This year, the University ranked seventh out of 102 participating medical centers. UUHC also received the Supply Chain Performance Excellence Award and the new Ambulatory Care Quality and Accountability Leadership Award. Introduced this year, the Ambulatory Care Quality and Accountability Study honors academic medical centers (AMC) that demonstrated excellence in delivering high-quality outpatient care as measured by the UHC Ambulatory Care Quality and Accountability Study. Outpatient care at the University of Utah includes visits and services at our 12 community clinics including our South Jordan and Farmington Health Centers. 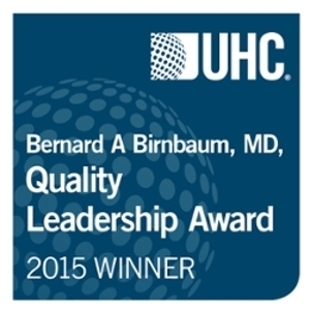 The 2015 Quality Leadership award winners were announced Oct. 1 at the UHC Annual Conference 2015 in Orlando, Fla. This year’s top-10 list was expanded to include all 12 teaching hospitals to earn a five-star rating. The University also received the 2015 Supply Chain Performance Excellence Award for raising the quality of its care while lowering costs. Medical centers were judged on their efficient use of supplies and inpatient medications and for their operating margins. UHC’s Quality and Accountability Study is one of the most rigorous available. It uses readmission rates and Joint Commission’s core measures as part of its effectiveness score: acute myocardial infarction, heart failure, pneumonia, surgical care improvement, outpatient, immunization, emergency department, stroke, and venous thromboembolism. It looks at mortality not just across eight major service lines, but also comprehensively across 27 service lines. It investigates half-a-dozen patient safety indicators from the Agency of Healthcare Research and Quality and federal infection surveillance metrics. It evaluates the efficiency of the health system based on per-patient costs and length of stay vs. expected. Finally, it tabulates patient satisfaction data from the Centers for Medicare and Medicaid Services’ HCAHPS surveys sent to patient homes. University of Utah Health Care is the only academic health care system in the Intermountain West. The system provides care for Utahns and residents of five surrounding states in a referral area encompassing more than 10 percent of the continental United States. The system receives more than 1 million outpatient visits and nearly 30,000 inpatient admissions annually. Visit https://healthcare.utah.edu for more information. UHC is an alliance of the nation's leading nonprofit academic medical centers, which are focused on delivering world-class patient care. Formed in 1984 and based in Chicago, UHC fosters collaboration with and among its 117 academic medical center and 310 affiliated hospital members through its renowned programs and services in the areas of comparative data and analytics, performance improvement, supply chain management, strategic research, and public policy. UHC helps its members achieve excellence in quality, safety, and cost-effectiveness. For more information, visit uhc.edu.